We recently had the opportunity to take our first look at an XGI video card with the review of the 128MB Volari V3XT, and were quite impressed with the features that made it ideal for the niche HTPC market. As noted in that review, we were aware of six cards in their line up, including the Volari V3, Volari V3XT, Volari V5, Volari V8, Volari V8 Ultra, and Volari Duo, and were curious what models further up the price / performance chain would offer. To our delight, we have the 256MB Volari V8 to satisfy those curiosities. XGI is less than two years old, founded in June 2003, but the founders of the company made early acquisitions of Trident Microsystems and Silicon Integrated Systems’ graphics divisions to establish a solid base for their technology to grow from. With ATI and nVidia dominating the graphics card market, these acquisitions and XGI's own innovation should help them gain at least a decent share of this large market. An overview of the V8 is shown in the promotional image above, where one can see that the V3XT and V8 share the same color blue on their PCBs, and the same arrangement of output connectors. Through this review other similarities will be documented, but for the most part it will show that these are two different cards in terms of features and performance. 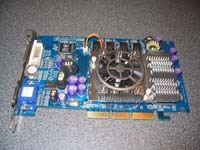 The Volari V8 is an 8x AGP card featuring 256MB of DDR memory running at 201 MHz, and a GPU with a 300 MHz core. Testing will reveal if the Volari V8 can hang with comparable ATI and nVidia cards, but just by appearances the V8 looks a bit more ready for gaming than its little brother the V3XT. In general, the packaging for the review sample is documented before getting into the heart of the review. The delivery method was a bit different for this card, as it was placed directly into my hand by an XGI representative, and I did not receive a proper retail box to show. The image below is taken from the XGI website, and provides a glimpse of a box that the Volari V8 might ship in (although the card pictured is different than the one we received). 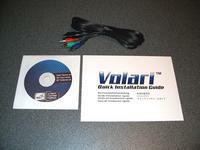 The images below provide a closer look at the version of the XGI Volari V8 that we received for this review. 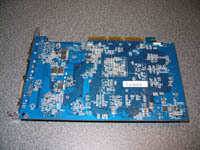 The card features a full height PCB colored the same vibrant blue as the V3XT. The processor is covered by a large aluminum heatsink that is cooled by a 50mm fan. 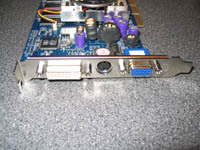 The heatsink may be large in area, but it has a low profile, making it clear that it will not interfere with any cards in adjacent PCI slots. None of the 256MB of memory is mounted to the back of the card, giving it a fairly plain appearance, but perhaps making cooling modifications a bit easier. Although the stock heatsink is cantilevered over four of the eight chips without touching them, an after market cooler and ramsinks would be easy to install and in a new inverted design case would allow all the heat to rise off of the card. The SIS 301 chip seen in the upper right corner of the above left image gives the V8 the ability to output to television, as well as the availability of a secondary display. As seen in the below left image, the V8 takes full advantage of these capabilities by providing a DVI, TV-out, and 15-pin VGA connection. The card is dual display capable, and can output to television either in composite, s-video, or RGB component video formats. The above right image shows what was included with the XGI Volari V8. You have a cable for RGB component video output, an installation CD, and a Quick Installation Guide. Most cards that include a TV out cable will provide an s-video or composite cable, but due to the V8's ability to output HDTV (just like the V3XT) the cable best suited for this application was included... a nice touch.